Woohoo! My first post! 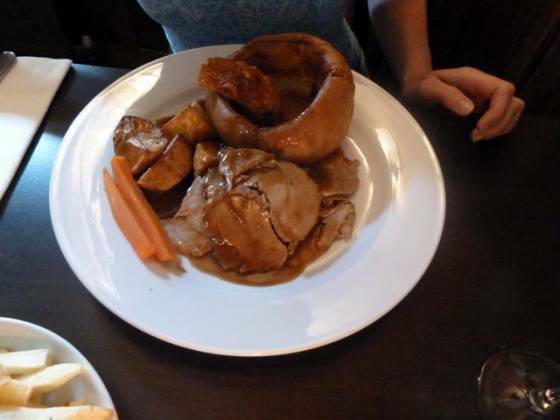 Claire’s let me add a review of our Sunday lunch in Iver, at a pub / restaurant called “The Swan”. We have eaten here previously, although it was for an evening meal. Last time, we felt it was good value, so thought of giving it another go, with the view to a write up. I made the reservation over the phone (I like things being planned; it was spontaneous deciding to eat out, isn’t that enough?). We actually use a discount card quite often from “The Gourmet Society“, where we are supposed to get a discount on food. The Gourmet Society site said that The Swan should give a discount on Sundays, after phoning to reserve a table I was told it is not accepted on Sundays. Disappointing, but remembering the experience last time, I still wanted to give their Sunday roasts a go. Sunday lunch was for just the two of us. 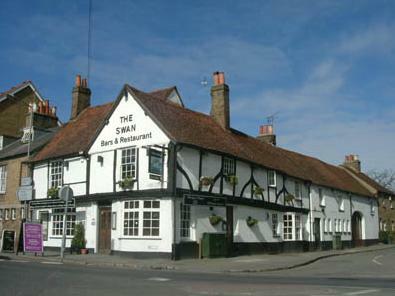 The pub is on the High Street in Iver, and had plenty of parking spaces. It was a bit confusing on where to go when we entered the pub; the restaurant was on the right, the bar being on the left and no “reception”. We managed to grab someone though, and they showed us to our seats. I expected the restaurant to be a lot busier than previously but unfortunately it was just us and two other couples throughout the whole meal (and this is at 13:00 on a Sunday). The restaurant was decorated in a bizarre manner, with a mix between Mediterranean and theatrical. On the walls were theatre masks, whilst the colour scheme was a mixture of yellow / terracotta. Also, the music was strange, ranging from Latin through to 7 year old “pop” (Robbie Williams, Angels). Basically, the atmosphere wasn’t the best. The wine selection was quite good, with a number of different reds, whites, rosés and sparkling. It was mid-range priced too, with a large red at about £5.50 a glass. The menu had a lot of choices available, ranging from chicken paté for starters, through to pizza and other main meals (pages and pages!). The Sunday roast options were on the last pages, giving us four options: Chicken, Beef, Pork and Lamb (with all the trimmings) – no vegetarian options which is a shame. Claire chose the pork, I chose the sirloin beef. I was actually asked how I would like it cooked, which threw me a bit. The food came out very quickly; we were only waiting a couple of minutes at best. The vegetables came out first, and we were asked what sauces we wanted (Claire asked for apple, I almost asked for ketchup :-) ). Then, the plates came out with our meat, Yorkshire pudding and (duck fat roasted) potatoes . 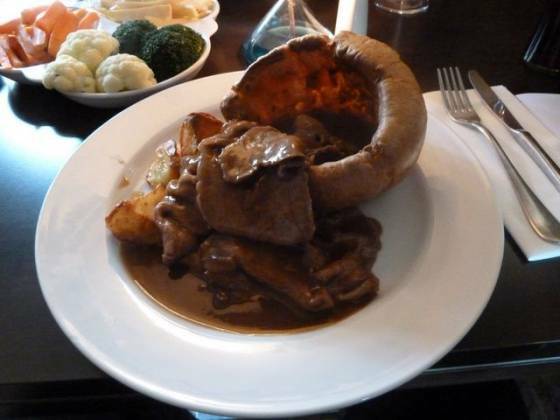 Meat was draped over the Yorkshire, which was full of gravy, the potatoes hiding underneath it all. What more could you wish for? Maybe a bit more gravy? The waitress automatically bought more out, without even being asked! We felt very spoilt! 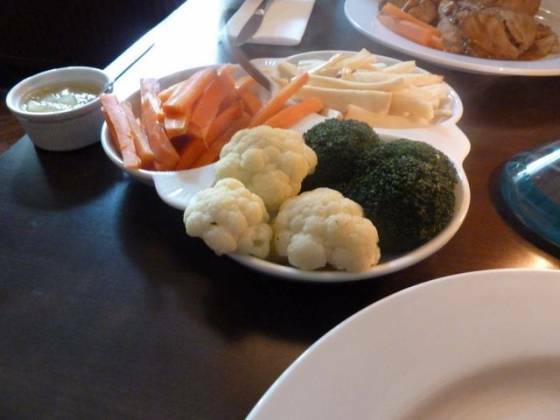 The vegetable selection was plentiful, with carrots, broccoli, cauliflower and parsnips, all tasting very fresh. The potatoes tasted above average, although seemingly been cooked earlier in the day and then re-heated (I really like fluffy potatoes, these tasted more like school dinner ones). Unfortunately, I think it was the same with the Yorkshire pudding. The meat seemed to have been pre-sliced, which may explain why I was asked how I would like the beef cooked. Claire enjoyed the pork crackling though! The waitress was extremely attentive, checking with us a couple of time through the meal if everything was ok.
After demolishing the meal, I had to have a glance at the dessert menu. When I say “glance”, I mean that I ordered the raspberry cheesecake. Claire grabbed a coffee and was asked if we want them at the same time (yes please!). The cheesecake came out a couple of minutes later, again extremely well presented with a dusting of icing sugar and raspberry sauce. The cheesecake was quite nice, although not homemade unfortunately. Claire’s coffee came as an espresso in a larger coffee cup, with hot water on the side as well as a jug of milk and sugar. It was a nice touch, allowing Claire to choose how strong to have the coffee. Overall, the experience was definitely a positive one. The meat and potatoes were average but the extra gravy, veg and service more than make up for it. Just expect it to be very empty!